Aikido classes are taught by Mike Cardwell chief instuctor, Nidan (2nd degree blackbelt) and Melissa Gamble, Nidan, under the direction of Frank Roberto Sensei, Yondan (4th degree black belt). Michael Cardwell started his training in Aikido under Frank Roberto Sensei at Eastern Idaho Technical College in 1999. He trained under Roberto Sensei for the next 13 years, and in 2010 became the first student at Snake River Aikido to earn their blackbelt directly from Roberto Sensei. In 2012 Mike assumed the role as Dojo Cho of Snake River Aikido, after Roberto Sensei moved out of state for his job. In 2014 Mike received his Nidan from Cyndy Hayashi Sensei, and continues to train under her whenever possible. 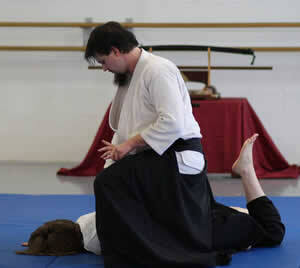 He is currently the chief instructor at Snake River Aikido, where he co-teaches with Melissa Gamble. Mike was married in 2011 and lives in Idaho Falls with his Wife, dog and cat. Frank Roberto started Aikido at the University of California Riverside Aikido club, where he earned his Shodan under the instruction of Ace Atkinson Sensei. In 1983 Frank moved to the Bay area where he trained with Pat Hendricks Sensei for a year and a half, until moving back to Davis to start a postdoctoral fellowship. Frank fell into the role of sensei while in Davis, and for the next four years, ran the club on campus with help from Sensei Mark Bartosh, Ken Gee, and Brian King. 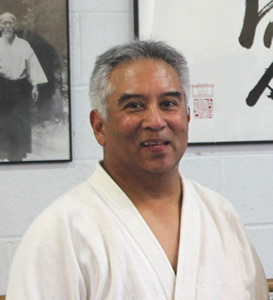 Frank brought Aikido to Idaho Falls in 1988 when he moved there from California; through the martial arts community in Idaho Falls, he connected with some police officers interested in Aikido and began training at Skyline High School. 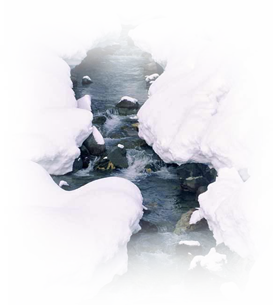 In 1989, Frank established Snake River Aikido at Eastern Idaho Technical College, and after 18 years of being at EITC the dojo moved to its current location at the Idaho Falls School of Ballet. Frank received his 4th Dan in 2008; in May of 2012 he moved to Colorado where he currently resides.